Newly elected members and officers of the CAA Board of Directors will join the governing body at its spring meeting, to be held on Sunday, May 6, 2012. Charged with CAA’s long-term financial stability and strategic direction, the board sets policy regarding all aspects of the organization’s activities, including publishing, the Annual Conference, awards and fellowships, advocacy, and committee procedures. Anne Collins Goodyear, assistant curator of prints and drawings at the National Portrait Gallery, Smithsonian Institution, in Washington DC, will serve as the organization’s next president for a two-year term, beginning May 2012. At its February 2012 meeting, the board elected new officers—four vice presidents and a secretary—from among its members to serve one-year terms, from May 2012 to April 2013. CAA will publish a report on the spring board meeting later this month. In its regular roundup of obituaries, CAA recognizes the lives and achievements of the following artists, scholars, designers, architects, photographers, curators, dealers, filmmakers, and other men and women whose work has had a significant impact on the visual arts. This month was marked by the loss of the sculptor Elizabeth Catlett, the divisive art critic Hilton Kramer, the scholar and curator John Golding, and the art dealer Donald Young. Al Ross, a cartoonist at the New Yorker for over sixty years, passed away on March 25, 2012. He was 100 years old. Born in Romania, Ross began his career in the 1930s working alongside his four brothers at the Saturday Evening Post and Collier’s before joining the New Yorker in 1937. His arch sensibility and educated silliness were illustrated by sketchy line drawings of arguing couples, animals, therapists, and other denizens of the magazine’s cartoon universe. Read all past obituaries in the arts in CAA News, which include special texts written for CAA. Please send links to published obituaries to Christopher Howard, CAA managing editor, for the May listing. At its February meeting, the CAA Board of Directors approved a revised statement on the formation of task forces. The Revised Procedures for Task Forces (2012) added the step of the Executive Committee’s review and prioritization of all task-force proposals prior to their presentation to the board for discussion and approval. The revision will ensure the streamlining of the task-force approval process. The board periodically establishes task forces to gather information and provide recommendations concerning areas of importance to the organization. Any CAA member may suggest the formation of a task force by sending a request to develop a proposal to the board president or to the chair of a standing committee. Once the board adopts a resolution establishing the task force, the task-force chair will work with the executive director to determine staff involvement, frequency of meetings, and division of responsibilities for the team. The task force will prepare a report based on its research to the board and may also recommend additional work to be undertaken to complete its task. Sue Johnson. Pitt Rivers Museum, University of Oxford, Oxford, England, United Kingdom, January 24–June 10, 2012. The Nature of Curious Objects: Sue Johnson’s Paper Museum. Painting. Joan Marie Kelly. Visual Arts Gallery, Habitat Center, New Delhi, India, April 11–17, 2012. Initial Encounters. Painting and drawing. Margaret Murphy. Kresge Foundation Gallery, Ramapo College of New Jersey, Mahwah, New Jersey, March 28–May 2, 2012. Margaret Murphy, A Ten-Year Survey; Decoding the Marketplace: Coupons, Dollar Stores, and eBay. Painting. Margaret Murphy. Harold B. Lemmerman Gallery, New Jersey City University, Hepburn Hall, Jersey City, New Jersey, January 30–March 7, 2012. Margaret Murphy, A Ten-Year Survey; Decoding the Marketplace: Coupons, Dollar Stores, and eBay. Painting. Michelle Grabner. Green Gallery, Milwaukee, Wisconsin, January 21–February 26, 2012. Cottage Work. Painting. Julie Green. UNO Art Gallery, University of Nebraska, Omaha, Nebraska, January 13–February 8, 2012. The Last Supper. Painted ceramic plates and video. Sharon Louden. Burnet Gallery, Le Méridien Chambers, Minneapolis, Minnesota, March 1–May 6, 2012. Movement and Gesture. Painting, drawing, sculpture, and animation. Ellen Carey. Nina Freudenheim Gallery, Buffalo, New York, March 3–April 11, 2012. Struck by Light. Photography. Nayda Collazo-Llorens. 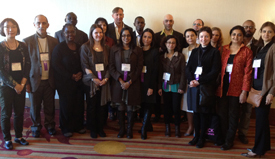 LMAKprojects, New York, March 16–April 22, 2012. Across Doom Hopes the Guiding Fever. Drawing. Janet Goldner. Corridor Gallery, Interchurch Center, New York, March 15–April 13, 2012. i ni ce, thank you, merci. Sculpture. Eve Ingalls. SOHO20 Chelsea Gallery, New York, February 28–March 24, 2012. Out of Place and Time. Sculpture. Debra Ramsay. Blank Space Gallery, New York, April 19–May 19, 2012. Desire Lines. Painting. Linda Stein. Flomenhaft Gallery, New York, May 17–June 23, 2012. The Fluidity of Gender: Sculpture by Linda Stein. Sculpture. Marianne Weil. Kouros Gallery, New York, May 3–31, 2012. Fusion: Glass and Bronze. Sculpture. Leigh-Ann Pahapill, view of the installation Likewise, as technical experts, but not (at all) by way of culture, 2012. Leigh-Ann Pahapill. Cornell Fine Arts Museum, Rollins College, Winter Park, Florida, January 28–May 13, 2012. Likewise, as technical experts, but not (at all) by way of culture. Installation. Michael Darmody. New Mexico Arts Centennial Project Space, Santa Fe, New Mexico, January 13–February 17, 2012. House of Cards. Installation. Gerit Grimm. Long Beach Museum of Art, Long Beach, California, March 15–July 8, 2012. Gerit Grimm: Beyond the Figurine, Contemporary Inspirations from the Museum’s Collection. Ceramic sculpture. Ellen Mueller. Pueblo Fine Art Gallery, Colorado State University, Pueblo, Colorado, March 9–April 6, 2012. Ladders in the Desert. Video, photography, and installation. Olga Ponomarenko. 825 Gallery, Los Angeles Art Association, Los Angeles, California, March 10–April 2, 2012. Romantic Punks. Painting. Ruth Weisberg. Jack Rutberg Fine Arts, Los Angeles, California, February 18–June 30, 2012. Ruth Weisberg: Now & Then. Painting, drawing, and printmaking. Edie Winograde. Robischon Gallery, Denver, Colorado, March 29–May 5, 2012. Appropriated Histories: Recent and Past Photographs. Photography. Angela Young. Gallery 100, Tempe Center, Herberger Institute for Design and the Arts, Arizona State University, Tempe, Arizona, April 23–27, 2012. Human Nature. Printmaking and drawing. Janet Landay is project manager of the CAA International Travel Grant Program. 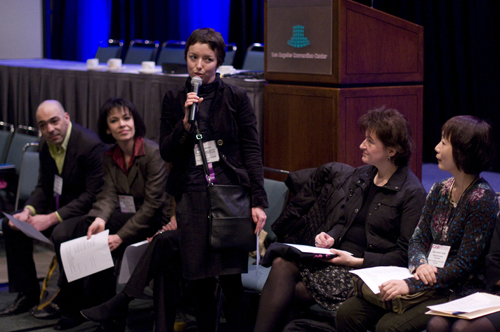 Last February, twenty art historians and curators from eighteen countries around the world attended the 2012 Annual Conference in Los Angeles through the CAA International Travel Grant Program, a new initiative that was generously funded by the Getty Foundation. 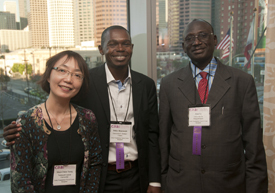 For many grant recipients, this visit was their first to the United States, and for most of them it was their first time at the CAA conference. By coincidence, on the conference’s opening day, the Los Angeles Convention Center held two swearing-in ceremonies for twenty thousand new citizens and their guests, welcoming people from several nations to the US. Indeed, the CAA group felt like a miniature United Nations, and it was equally moving to see colleagues arrive at the conference from countries around the world. Participants included: Ganna Rudyck (Ukraine), Irena Kossowska (Poland), Pavlina Morganová (Czech Republic), Dóra Sallay and Gyöngyvér Horváth (Hungary), Cristian Nae (Romania), Daniel Premerl (Croatia), Malvina Rousseva (Bulgaria), Salam Atta Sabri (Iraq), Angela Harutyunyan (Lebanon), Nadhra Shahbaz Naeem Khan (Pakistan), Parul Pandya Dhar (India), Jageth Weerasinghe (Sri Lanka), Shao-Chien Tseng (Taiwan), Olabisi Silva (Nigeria), Didier Houenoude (Benin), Jean Celestin Ky (Burkina Faso), Federico Freschi and Judy Peter (South Africa), and Rosa Gabriella de Castro Gonçalves (Brazil). Read more about the recipients, their home institutions, and their areas of interest. The purpose of this initiative was to encourage greater participation from countries not well represented at CAA’s Annual Conference in order to bring a more diverse and global perspective to the study of art history. The Getty travel-grant participants, as they became known, were selected by a jury of CAA members from among 150 applicants based on three general criteria: all had to be professors of art history, artists who teach art history, or museum curators with advanced degrees in art or art history; they had to work in a country where art history is an emerging discipline; and they needed to explain how attending the conference would significantly support or strengthen their work. To welcome the participants and to ensure that they got the most out of the conference’s abundant offerings, members of CAA’s International Committee and representatives from the National Committee for the History of Art (NCHA) volunteered to act as hosts. CAA warmly thanks these members for their service as hosts: Ann Albritton, Frederick M. Asher (NCHA chair), Kathryn Brown, Nicola M. Courtright, Diane Derr, Stephanie Dickey, Thomas W. Gaehtgens, Paul B. Jaskot, Geraldine A. Johnson, Jennifer Milam (International Committee chair), Steven Nelson, Nada Shabout, and Beth A. Steffel. This wonderful aspect of the program revolved around informal dinners, lunches, and drinks, in which both participants and hosts could trade stories and share information about the ins and outs of practicing art history in their respective countries. Two roundtable meetings brought everyone together to meet CAA staff, providing opportunities for assessment and reflection on the various aspects of the conference program. Equally stimulating were the friendships made among the participants, as they learned about each other and discovered shared interests and challenges. Now, nearly two months later, a number of grant recipients have already begun to collaborate on research and teaching projects, with ambitious plans in the works. In the coming months, CAA will publish online interviews with several participants and report on their collaborative work as it unfolds. Stay tuned to future issues of CAA News for these special announcements. Linda Downs is CAA executive director, and Anne Collins Goodyear, associate curator of prints and drawings at the National Portrait Gallery, Smithsonian Institution, is the incoming president of the CAA Board of Directors. Anne Collins Goodyear and Linda Downs attended a day of meetings and panel discussions presented by the National Humanities Alliance (NHA). The event, held on March 19, 2012, in Washington, DC, stressed the practical significance of the humanities for a democratic society and highlighted the important contributions of recent research projects. It also helped prepare participants for Humanities Advocacy Day, taking place on Capitol Hill the following day. CAA is a member of NHA, which advocates federal funding of the humanities. In addition to its annual meeting, NHA organizes Humanities Advocacy Day, which brings critical information to participants and prepares them for congressional visits to support the National Endowment for the Humanities, the National Historical Publications and Records Commission, the Fulbright Program, the Institute for Museum and Library Services, and numerous Department of Education programs in the humanities. The first panel introduced a wide variety of historical research projects, such as the Dictionary of American Regional English, which took ten years to develop, according to its senior editor, Luanne von Schneidemesser, and now has a broad value to researchers of all kinds, from linguists to forensic detectives. Kenneth Price, a professor of literature at the University of Nebraska in Lincoln, discussed the Walt Whitman Archive, an online resource of thousands of documents related to the poet’s writings, and Colin Gordon, a history scholar at the University of Iowa, talked about his recent book, Mapping Decline: St. Louis and the Fate of the American City. Finally, Connie Lester, a professor of history at the University of Central Florida, presented the Regional Initiative for Collecting the History, Experiences, and Stories, an oral-history program that is taking place in her state. Each project demonstrated its uses to both academic and public researchers. Hunter Rawlings, president of the Association of American Universities, led a second panel that focused on “The Role of the Humanities in Undergraduate Education,” offering a historical case study of James Madison to illustrate the value of prolonged study in the humanities as a means to cultivate flexible and cohesive thinking. Madison studied the classics and philosophy at New Jersey College (later renamed Princeton University). After graduation, having no specific profession or direction, he moved back home with his parents and asked the president of the college if he could continue studying under his tutelage, in effect becoming the first unofficial graduate student of the college. Madison eventually put his academic background to good use when he became the primary author of the Bill of Rights, adopted by the House of Representatives in 1789, and was later elected the fourth president of the United States. Rawlings stressed that liberty and learning are intrinsic to the humanities, noting that countries with autocratic political systems can have successful science and math curricula but that the arts and the humanities require freedom of expression to flourish. The panel’s second speaker, Raynard Kington, president of Grinnell College and acting director of the National Institutes of Health, observed that humanities majors tend to be “life-long learners,” and that many leaders, even in the sciences, have strong humanities training. The humanities, he noted, might benefit from a stronger advocacy base that could demonstrate the tangible benefits of humanities training as a means of encouraging legislators and administrators to protect humanities education, even at times of financial duress. The role of the humanities in undergraduate education in direct relation to the job market was addressed by Sandra L. Kurtinitis, president of the Community College of Baltimore County, which boasts a student body of 45,000. She emphasized that two-year schools provide every student with an introduction to the humanities regardless of his or her associate-degree curriculum. Kurtinitis’s figures were astounding: 50 percent of all incoming freshmen at American colleges and universities are enrolled in one of 1,200 community colleges across the country, and the average age of the freshman class has risen to twenty-eight. Five million more students, she told us, will enroll in community colleges by the year 2020. In closing, Kurtinitis emphasized that all degrees lead to jobs, whether students decide to pursue careers as varied as poets, artists, nurses, or electricians. In his keynote address, Richard H. Brodhead, president of Duke University and cochair of the American Academy of Arts and Sciences’ Commission on the Humanities and Social Sciences, described the blue-ribbon panel of corporate and academic leaders who have come together to address the importance of the humanities in education and American life. Echoing Raynard Kington’s story about James Madison, Brodhead evoked an America that was built on the values of humanism and a strong liberal-arts education and called attention to the plight of budget cuts across the country that are scaling back humanities programs in elementary and high schools. Brodhead stressed the wide-ranging, lifelong effect a thorough education in the humanities can have for an individual, no matter what his or her chosen profession is. “The kind of intelligence that has brought the broadest benefits to our society,” he said, “is an active, integrative mind awakened to multiple forms of knowledge and able to combine them in new ways.” As part of Humanities Advocacy Day, on March 20, the panel presented recommendations to President Barack Obama and to Congress in support of the humanities in higher education. Luba Freedman, a scholar of Italian Renaissance art and a member of the Renaissance Studies editorial board and the Sixteenth Century Journal editorial committee, has been promoted to the rank of full professor in the History of Art Department at Hebrew University of Jerusalem in Israel. Scott Johnson, a sculptor, photographer, and installation artist, has received tenure in the Art Department at Colorado College in Colorado Springs. Susan Yelavich, a longtime faculty member at Parsons the New School for Design in New York, has been appointed director of the master of arts in design studies program at her school. Emily Beeny will join the Museum of Fine Arts, Boston, in June 2012 as assistant curator of nineteenth-century painting in Art of Europe. Beeny is presently a doctoral candidate completing a year in Paris on the Rudolf Wittkower Dissertation Fellowship from Columbia University in New York. Olivier Meslay, senior curator of European and American art and Barbara Thomas Lemmon Curator of European Art at the Dallas Museum of Art in Texas, has been named associate director of curatorial affairs at his institution. Joanne Pillsbury, formerly director of Precolumbian studies at Dumbarton Oaks in Washington, DC, has been named associate director of scholarly programs at the Getty Research Institute in Los Angeles, California. Joel Smith, currently Peter C. Bunnell Curator of Photography at the Princeton University Art Museum in Princeton, New Jersey, has been appointed curator of photography at the Morgan Library and Museum in New York. Smith begins his new position in September 2012. The Art Institute of Chicago in Illinois has received a $500,000 grant from the Indian government in support of a four-year exchange program with museums in India. The Art Institute is the first American museum to receive the grant, named the Vivekananda Memorial Program for Museum Excellence, in honor of Swami Vivekananda, an Indian musician, playwright, and philosopher. The Metropolitan Museum of Art in New York has taken steps to make its digital-image collection more comprehensive and accessible to the public by integrating staff from the analogue-image library into the digital-media department. The Rhode Island School of Design in Providence has partnered with the US Department of State’s Office of Art in Embassies to create a permanent, large-scale outdoor artwork for the future American embassy in Rabat, Morocco. An artist and RISD alumnus, Jim Drain, spearheaded the project with a special six-week course called “Art in Embassies: Morocco,” which he taught in winter 2012, collaborating with students and a visiting Moroccan artist. The artwork will debut on November 30, 2012, at the Smithsonian Institution in Washington, DC. Each month, CAA’s Committee on Women in the Arts produces a curated list, called CWA Picks, of recommended exhibitions and events related to feminist art and scholarship in North Americn and around the world. The CWA Picks for April 2012 include exhibitions from all over the United States and Europe. Kate Gilmore shows new videos at David Castillo Gallery in Miami, the city in which the German-born artist Dara Friedman filmed her most recent work, Dancer, which makes its debut at CAM Raleigh in North Carolina. Other April picks include exhibitions of new work by Sturtevant in Stockholm, Sarah Braman in Los Angeles, and Jacqueline Humphries in New York, as well as a retrospective of paintings and works on paper by Jaune Quick-to-See Smith at the Georgia O’Keeffe Museum in Santa Fe, New Mexico.